TICKS – Everything you will read about avoiding or repelling ticks will have the word DEET in it. From the CDC to the EPA, they all recommend using DEET to protect yourself and those you love from blood-sucking ticks. Instead, I'd like to discuss Natural Tick Repellents, tick control, and tips to avoid getting bit. 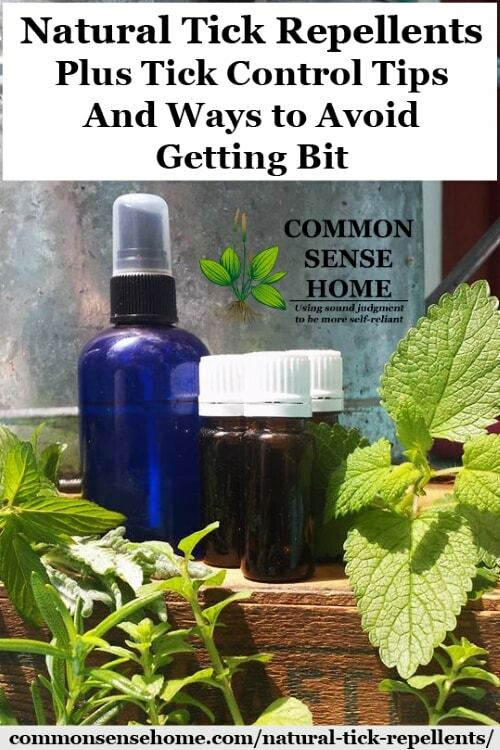 We also include recipes for tick repellent for humans and dogs made with essential oils, and how to remove a tick safely. In attempt to live a more natural lifestyle and work diligently to remove synthetic and toxic chemicals from our lives, I always look for an organic approach and alternatives to conventional methods. 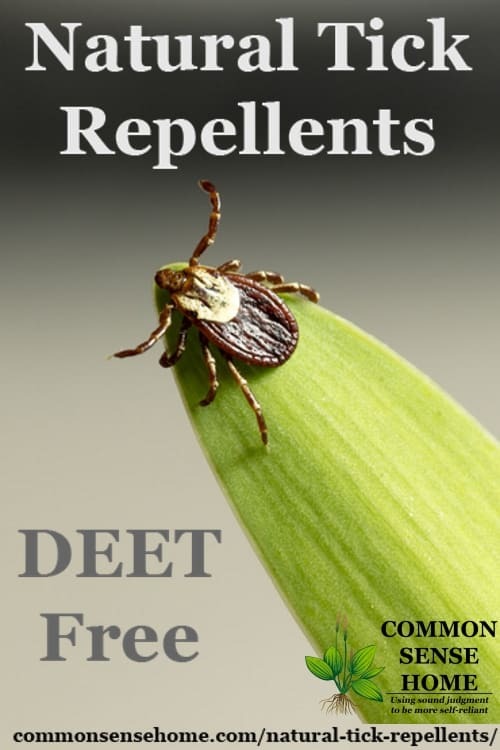 Even though DEET is recommended by everyone and everything that doesn’t mean it is safe for my family. It is up to us to make informed and educated decisions and decide whether or not we trust their advertising. See “The Hazards of DEET” for more information. So if you don’t use DEET, what do you use? Well, I have a safe, natural tick repellent alternative that is just as effective as DEET – continue reading to find out what it is! Ticks are small, blood-sucking arachnids (eight legged bugs related to spiders). They can range in size from as small as a pin’s head to as large as a pencil eraser. The different kinds of ticks can range in color from shades of brown to reddish brown and black. As they take in more blood, ticks become larger and larger. At their biggest, ticks can be about the size of a marble. After a tick has been feeding on its host for several days or weeks, they become engorged and can turn a greenish blue color. When done feeding, they usually fall off to breed, lay eggs and start the cycle again. There are many different types of ticks, but only the Blacklegged Ticks (Deer Ticks) carry the bacterium that causes Lyme disease. According to the CDC, Lone Star Ticks, American Dog Ticks, the Rocky Mountain Wood Tick, and the Dog Tick do not transmit the Lyme disease. Aside from Lyme disease, other tickborne diseases are: Southern Tick-Associated Rash Illness (STARI), Rocky Mountain Spotted Fever (RMSF), Ehrlichiosis, Babesiosis, Anaplasmosis, Tularemia and now Powassan Virus. Although tickborne diseases can have mild symptoms that may be treated at home, some symptoms can be severe (even cause death) and require hospitalization. If you have been bit by a tick, please seek the advice of a medical professional immediately. See Tick Bites: Symptoms and Treatments for more information. In 1881, a scientist named G. Haller published the first description of these structures, although he misunderstood their purpose. Haller believed these structures were auditory sensors (ears), when in fact they proved to be olfactory sensors (noses). So when a tick sits on a blade of grass with its front legs extended, it is effectively sniffing the air for your scent. What’s remarkable, however, is just how well the tick can smell you, and sense even your slightest movement. The Haller’s organ can detect the carbon dioxide you exhale with each breath, and the ammonia in your sweat. With legs outstretched, the tiny tick can pick up on all the foul odors people produce, from bad breath to belches, and it can even smell your farts. Ticks have an incredible sense of smell and can detect you coming, some even seek you out. The way that herbs work at repelling mosquitoes, spiders, ticks and other biting insects is that they provide you with sensory camouflage. They mask your natural scent and odors that the biting species find attractive. Tick Repelling Herbs – Which Herbs Keep Ticks Away? Many of the same herbs that repel mosquitoes and spiders also repel ticks. Sweetgrass – New research finds that sweetgrass, a meadow grass native to northern climates, contains chemicals that work as well as DEET in fending off the blood-sucking insects. Planting any of the above herbs, as well as Beauty Berry Bush and Mountain Mint, will act as a natural tick repellent for your yard. Now more than ever it is important to explore all of the constituents, properties, and applications for herbs because bacteria, parasites, viruses, and pathogens have become resistant to the current chemical and medical protocols. In many cases doctors and scientist have no plan B. They are working diligently at finding alternatives but time is running out. We need to arm ourselves with an herbal warfare apothecary against these invaders to protect us when all else fails (or be our first course of action). A team of scien­tists from the Scottish Agricultural College believes that the long term outlook for insect and parasite control may not be so rosy. Project leader Dr. Jos Houdijk states that it is now time to look for alternatives to the veterinary drugs which farmers in industrialized countries have come to rely on. “When these drugs were introduced in the west in the 1960s we thought they would solve all our problems but we couldn’t have been more wrong. Nowadays the parasites are becoming resistant and the consumer is becoming more aware about having products that have a minimum use of drugs. Alternative medi­cines are coming into fashion again. The long term solution to tick -borne disease prevention lies in the power of plants and herbs. These plant-based treatments, along with some knowledge of ticks and tick-borne diseases may be your best bet at staying healthy in the ensuing summer months. 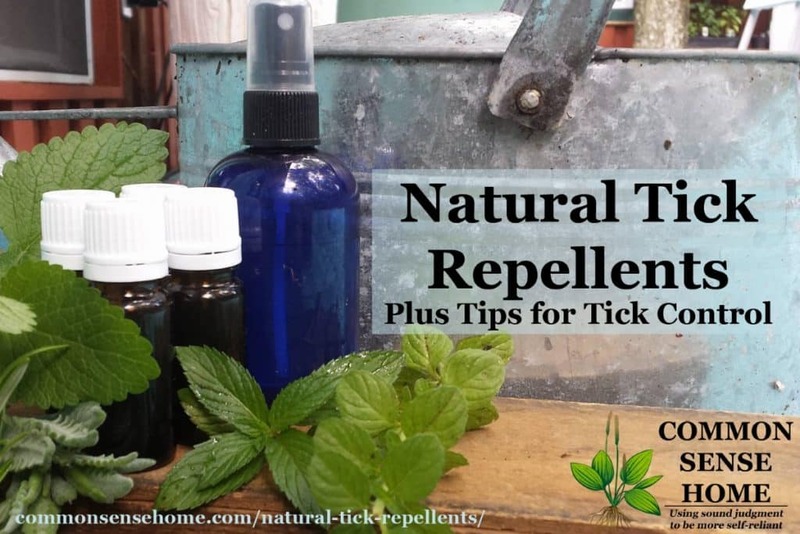 The top two natural tick repellents listed in this post (Rose Geranium and Sweetgrass) are two of these plant-based treatments. See: Mosquito-repelling chemicals identified in traditional sweetgrass and Bioactivity-guided investigation of geranium essential oils as natural tick repellents for more on studies demonstrating their effectiveness. Which Essential Oils Keep Ticks Away? 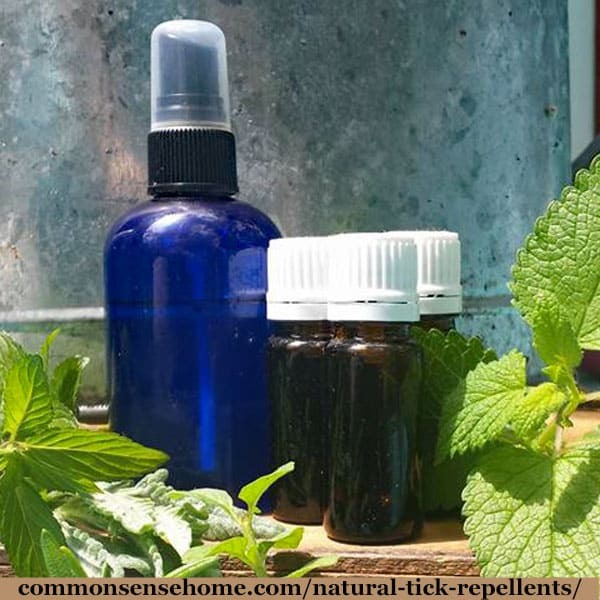 Any combination of the above herbs will work at repelling ticks, but the best essential oils for keeping ticks away are Rose Geranium and Sweetgrass. You can use whatever essential oils you have on hand from the list above, but make sure you use Rose Geranium and Sweetgrass as your primary tick repellent essential oils. 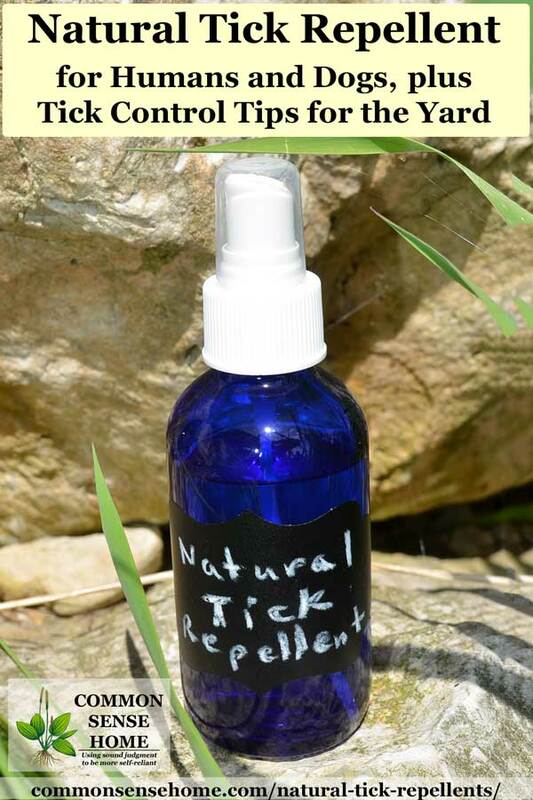 This is a safe, natural tick repellent for humans made with essential oils. A simpler tick repellent for dogs is listed below. Add all of the ingredients into the spray bottle and spray on clothes before going outside. Shake before using. Note: While you can use water, the other options are better for keeping the oils in solution. Regular tap water may contain contaminants, so distilled water is preferred. Taking Bitters – Herbalists have found that taking Gentian Bitters helps protect you from getting bit by ticks. Animals, insects and even fungi play an important role at keeping nature in balance. It is our job to help implement these natural alternatives when we see an infestation or an issue for concern, to protect the health of our family. Guinea Fowl – Guinea Fowl have been used to help reduce tick population and unlike chickens, they don’t damage the garden. Chickens – Our protein-loving feathered friends are huge fans of consuming ticks and any other insect they can scratch for. Opossum – Opossums can kill about 5,000 ticks in one season. Fire Ants – Fire Ants can clear a field of ticks (and most other creatures) quite effectively.We finally found a benefit to having fire ants! Nematodes and Fungi – Several kinds of parasitic nematodes and fungi infect ticks and can cause their demise. These have been investigated as potential means to reduce risk of ticks and tick-borne infections. The first defense to avoid getting bit by ticks is to know where ticks like to live. Ticks like to live in tall grasses and wooded areas with a moist and humid environment. Limiting your exposure to this type of environment will also limit your tick exposure. Don’t sit on logs – If you sit on a log for only five minutes in a tick infested area, you have a 30% chance of getting a tick on you. Inspect your clothes and body, especially: Under the arms, around the ears, inside the belly button, back of knees and in your hair. If you notice a tick on your skin or in your hair it is important you know how to remove it safely to get the entire bug. Here are the current recommendations for how to remove a tick safely from the CDC. Image and text courtesy of Tick Removal: How to Remove a Tick at cdc.gov. Note: The longer the tick stays attached, the more opportunity there is for disease transmission. Dogs seem to be the biggest domesticated victim of ticks, due to their proximity to the ground and their desire to roam the great outdoors. Although dogs can fall prey to tickborne disease, they can also bring ticks into the home, which can then bite your family members. (You can use vegetable oil, but almond oil contains sulfur, which is also a natural tick repellent.) Mix these ingredients together and place a few drops on your dog or on his collar. These tick repellent oils are not meant to be used with cats or pregnant animals. Tick tubes may help reduce tick numbers in a yard or controlled area. (On amazon they note that one box treats up to 1/2 acre.) 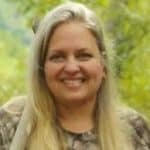 Because the primary focus of the tubes is killing ticks on mice in the treated area by providing the mice with treated nesting material, other wildlife such as deer may still act as carriers for the ticks. That said, the reviews on amazon look good overall and they seem promising for reducing the tick population in a controlled area. Those tubes are full of pesticides which are harmful to beneficial insects in your yard and garden. The tick tubes do contain pesticides, but contact with beneficial insects should be minimal, since the goal is to get the contents of the tubes into rodent nests. I’m not endorsing the tubes per se, but they are certainly better than wide scale spraying that kills everything. a guy shows how to easily make those on youtube. Laurie, thank you for the church chicken recipe and the recipes for the tick spray. I did order from Mountain rose some oil for the tick spray. You also might want to check these suppliers out: Bulk Apothecary, and VitaCost. I’m so sickened and shocked by the PETA article, that I’m at a loss for words! I can’t believe how cruel and awful they are! I’ll have nightmares for ever! God bless those poor animals! I just don’t understand what drives some people to be truly rotten. Where would you find organic wheatgrass essence oil ? Mountain Rose herbs does not sell it. Amber purchased hers through Essential Trading Post. I didn’t realize that there was a statistic done that showed that DEET negatively impacts motor skills and learning and memory dysfunctions. I personally don’t like to use any kind of spray because I don’t like feeling greasy afterward. I’ll have to talk to my wife about using things like sweetgrass to repel ticks and other insects this summer. I am considering using tick tubes this year but am a bit concerned as the chemicals used will killhoney bees. any suggestion about proper placement to avoid killing bees, but still getting the ticks? Keep tubes under trees or bushes, where rodents are likely to shelter but honey bees are less likely to visit. Some native bees (like bumblebees) do burrow, so there is always some risk or affecting pollinators. See my reply above about the use of permethrim which is a toxic chemical to many beneficial bugs and dangerous for humans to handle as well. As someone who has a large pollinator sanctuary property (5 acres) I will not use chemicals to help with pest control. I also have multiple chemical sensitivities and Lyme disease. Thank you for this interesting article. I’ve just recently moved to a country property where I walk my dogs daily. It was paradise until last week when the tick infestation began, and now it’s a bit of a nightmare! Been doing lots of research on natural remedies and am grateful for your advice. However, it seems important to add that the bottle you mix your essential oils in should be made of glass, as these oils cause chemicals to leach out of the plastic and into the oils. Now, where to find a glass spray bottle…..? You may be able to find them locally if you have a store in your area that sells herbal products, or you can order them online through retailers like Amazon. Here’s a link to a set of two 4 ounce glass spray bottles. Whole Foods and some health food stores have them. Thanks for your article! I was wondering what age(s) the natural tick repellent can be used for? I have a 2 year old and a 9month old, if not suitable do you recommend something else? According to Using Essential Oils Safely “We suggest no essential oils on or around babies before the age of 6 months, due to their thinner skin and immature immune systems”. Personally, I would just use lightly on the clothes, avoiding skin contact and the shirt around their face. Watching for any signs of a reaction, redness or rash. If any signs of reaction occur, remove clothes immediately, wash skin and contact their doctor. I have been reading on how to protect my family and dog from ticks. Cedar Oil has been mentioned a lot, but did not see in your article. Thought on use of Cedar Oil? I have read that some dedar oils can be toxic to pets UNLESS it it Texas Cedarwood. Things like red cedar or others should not be used on pets. Same with tea tree oil (unless seriously diluted). Just because it is okay for us to safely use, not all things are okay for pets. The brand of Texas Cedarwood I found was Auracacia brand. Great article! Just wanted to note that since this was posted, the Borrelia bacteria have been found in many more bugs than just deer ticks…even mosquitoes! Thanks. I’ll have to look up more info and adjust the post. Also birds, fleas, mice and other rodents like squirrels, spiders, mosquitoes. ALWAYS SHOWER after being outside. Lyme Disease is horrible…please protect you and yours. Some studies indicate that mosquitoes may be a possible source of transmission. I’ve had some luck putting a small amount of apple cider vinegar in my dogs water bowl during tick season. They don’t mind the flavor of it at all either. I also add brewers yeast to their food, not sure if it’s helping with the ticks too, but they really enjoy it. Thank you so much for sharing this article, I have some pennyroyal around and will plant a lot more now that I know it deters them. Both of those should be good for their general health, too. DEET makes my skin burn as if I had sprayed myself with acid. I find rubbing fresh catnip leaves on my skin repels mosquitoes and other biting insects. I also whiz fresh catnip in liquefied (warmed) coconut oil or olive oil in the blender, let it set in a jar for up to a week, filter it, then rub or spritz the herbal oil on exposed skin. Coconut oil helps prevent sunburn, too, so this is a double blessing. This year, I will try adding other recommended fragrant herbs to the mix. I’m a fan of catnip, too. Do you have a homemade solution to repel chiggers and mosquitoes? The tick repellents should be reasonably effective on chiggers, too. The tick repellant recipe says to spray on clothes. Is there any reason not to spray on the skin as the summer temps climb and we wear less clothing? Certainly if a person has a sensitivity to any of the ingredients, but do any of the other oils have potential side effects or concerns? The reason for the suggestion is to avoid any skin irritation issues as a precautionary measure. Personally, I spray directly on my skin but I would not give that advice out to others. From the research I have done, there are no known reactions or side effects. I also try to wear clothes from top to bottom, regardless of the weather, if I am in a tick infested area. Thanks for the recipe on natural repellents. I was wondering how many times a day would I have to spray my grandsons clothes. He goes to camp all day, so will the repellents last all day? Unfortunately, the answer to this question is not a one size fits all. As you see from the article, there are many variables that come into play. Blood type, sugar intake, sweating and more. I am one of those people who can attract biting insects when no one else around me is getting bit so I tend to have to reapply often. MY husband is opposite and applies once and is good to go. I would send him with the spray bottle and show him how to properly spray his clothes if he is old enough or give it to the camp leader. Thank you for that useful information, Laurie. I love the smell of rose geranium oil, but just the smell of it gives me a terrible headache. Would it be as effective for me to double up on the sweetgrass and leave the geranium out? Maybe not quite as effective, but close enough, and much better to not get a headache. Is the natural tick repellant recipe you recommend safe to use on kids? I have a 21 month old son who loves to be outside and I would like to use a natural form of repellant on him. Aaron, I would not use Essential Oils on babies or pregnant women. However, I would use the whole herb recipe provided in this article. Children under two are still developing their immune systems and prone to chemical reactions. If you do use oils, make sure they are diluted in a carrier oil, alcohol, witch hazel, or water, and use on their clothes away from their face. It is always a good idea, regardless of age, to apply to a test area like the back of the wrist to check for reactions. How long does the mixture last before it doesn’t become effective ? Do you mean once applied or in the bottle? I’d like to know the answer to both questions, please! The answer to ‘how long do the oils on the skin last’ is a harder question to answer then in the bottle because of all the variables. People sweat differently, have different skin types, blood types (blood types play a role in attraction to biting insects), what clothing your wearing and so on. My husband and smallest daughter only have to apply the spray once when they are outside for the day. My son and I have to apply every couple of hours because we attract biting insects more. I have included an excerpt from a great article below. Also included in the original article is the shelf life per oil. Personally, I have used my spray bottles for two years or more without issue. I keep them in a dark glass bottle and out of the sun. I hope this helps and please let me know if you have further questions. “In general, shelf life is determined by the chemical composition of the essential oils, some of which oxidize or evaporate more quickly than others. Is rose geranium oil different from plain geranium oil as far as repellant effectiveness? In addition, you can exchange one of the mentioned herbs (oils) for another depending on what you have on hand. Hope this helps, please let me know if you have any further questions. Thank you for the thorough response! I do have another question since you say other oils can be exchanged for something I have on hand. Is there another choice for sweetgrass specific to ticks? I have read that eucalyptus citradora is better than DEET, but that was specific to mosquitos. Maybe also for ticks? 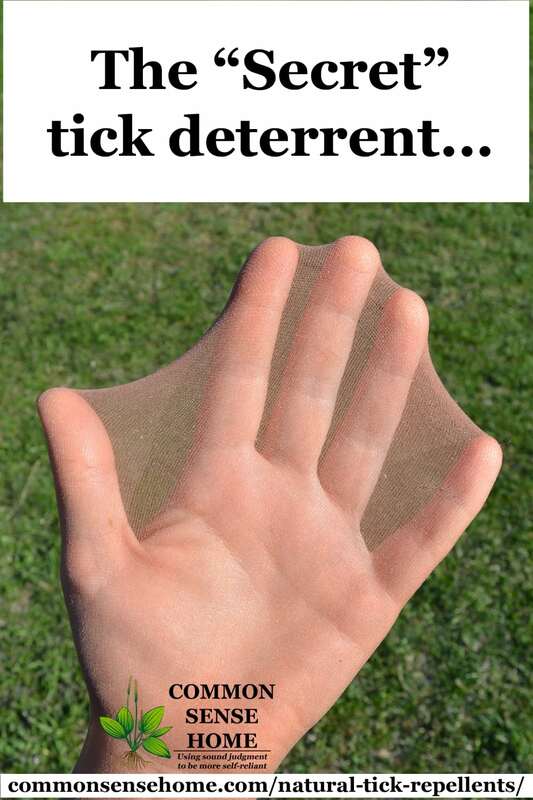 We do have another article specifically for ticks here https://commonsensehome.com/natural-tick-repellents. The premise of using many essential oils is they mask your scent and some oils (herbs) actually repel insects because they simply don’t like the scent. So it’s not detrimental to the recipe to omit or exchange one. Sweet Grass oil has a very strong floral scent, I believe this is why it is effective. But other oils can work just as well. What’s the criteria to purchasing sweetgrass oil? The comments to the product you linked to are not too favorable. Any other vendors? How do I know what to look for -pure Sweetgrass oil or a blend/carrier oil? Amber’s offline tonight recording a podcast, so I can’t find out where she purchases her sweetgrass oil. The only other amazon listing is for sweetgrass fragrance oil, which has 5 stars but only one review. Thanks for inquiring. I purchased my sweetgrass oil from Amazon by Essential Trading Post. I have no intention of using this oil medicinally, only topically, so I didn’t give the reviews a lot of consideration. Here in the south, sweetgrass basket weaving is a part of our heritage, however, sweetgrass harvesting here is illegal. I have diligently looked for sweetgrass oil locally because it is so prevalent but I couldn’t find it. I did talk to some local basket-weavers and they all said they never get bit by bugs when working with sweetgrass. I was happy with the quality and scent of the one I purchased. As with any oil, you can get a good one or a bad one. Sweetgrass oil has a very strong floral scent and does an amazing job at masking your scent so mosquitoes can’t find you. 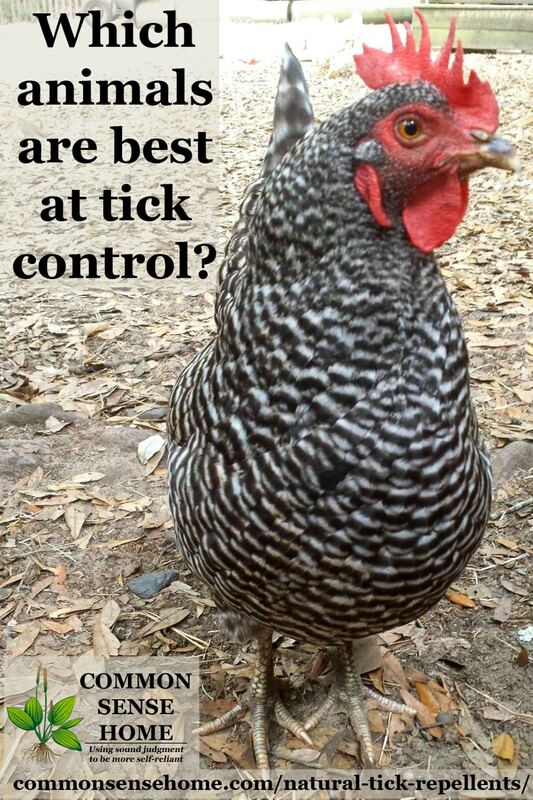 sure miss our chickens they really helped keep the ticks down. the prime month for ticks is July in our area. & remember the ticks about the size of a sesame seed are the dangerous ones & even at that they must attach & be in the skin for 12 -24 hours . Same suggested oils for over seas travel? Any add one youd reccomend or just apply more frequently? The general premise is the same no matter where you are – camouflage your odor with strong scents – so it should help. I would inquire with locals if there is a specific tick deterrent that they find more effective. Good to know thank you kindly! Pennyroyal is toxic to dogs. The site you linked describes a study where the oil was placed undiluted directly on the dog’s skin. Of course that’s going to cause problems. We never advocate the use of essential oils on the skin without a carrier oil, on people or pets. Hi Jodi and thanks for your concern about using the pennyroyal on dogs. The studies with pennyroyal and dogs were based on using the oil directly on the dog’s skin and there was only one reported case in the 1990’s. No further study has been done. I would never place any oil neat on the skin, dog, human or otherwise. In addition, the recipe I gave suggest a couple of drops on their collar. Since dogs can not lick their collar and a couple of drops are mixed with a carrier oil, I personally trust this recipe for my own dogs. That said, you can always use the first suggested oil or even cedar oil- mixed with a carrier oil of course. And as a reminder for other readers, essential oils should never be used with cats. Thank you so much for the information! My question is what can and cant I use on my pregnant dog for ticks, and why? Amber says if you mix up the tick repellent for dogs, skip the pennyroyal and just use the rose geranium. She says they also put essential oils in the the cleaning water when they mop the floors to make the ticks less welcome if they get in the house. Tape is plastic, and I am assuming you mean a plastic bag… plastic kills aquatic wildlife, and it would be just as simple to wrap it in the bag, tape it and throwing it in the garbage. Or just stick it onto tape by itself, wrap some tape around the tape, and throw that in the garbage. Anyhow, thank you so much for sharing all this good info! The intention is that you choose one of these methods, not all of them. You can put in alcohol – or a sealed container – or in tape – or flush it. I will see if I can make that a little more clear.